You asked, and we listened! Now without Essential Oils. Essential Oils are are powerful concentrated plant magic, and they can prove irritating for the most sensitive skin. While I am very careful about dilution ratios and safe essential oil concentrations, I also acknowledge that not everyone wants to use essential oils on their skin. This is one of my most popular toners, and I wanted to keep the soul of the original, while removing the essential oils and reducing the scent of Turmeric. This has a gentle base of plant hydrosols and Turmeric infusion. I have also removed the Witch Hazel. This is not the "toner" you are used to. No burning, stinging, or drying! Toner is meant to PH balance your skin, especially after cleansing. Organic Hydrosols come together with Organic Turmeric to pH balance + hydrate + soothe + brighten! ☯Excess Oil + Enlarged Pores : Tea Tree and Organic Witch Hazel tone pores and reduce oil. Lavender Hydrosol balances the toning nature of both and makes sure skin stays hydrated. ☯Breakouts + Acne : Essential Oil Blend helps fight acne-causing bacteria. ☯Excess Facial Hair : Turmeric + Lavender help reduce facial hair over several months. ❤Instantly calming + hydrating + soothing ! Toner helps close pores + reduce excess oil + remove residual cleanser. Turmeric does wonders for skin. It helps even tone + reduce scarring + and even helps reduce excess facial hair with continued use. Use twice a day for ninety days, and I also recommend looking into hormone balancing diets and herbs like Maca. ★Organic Tea Tree Hydrosol helps keep oil and breakouts at bay. 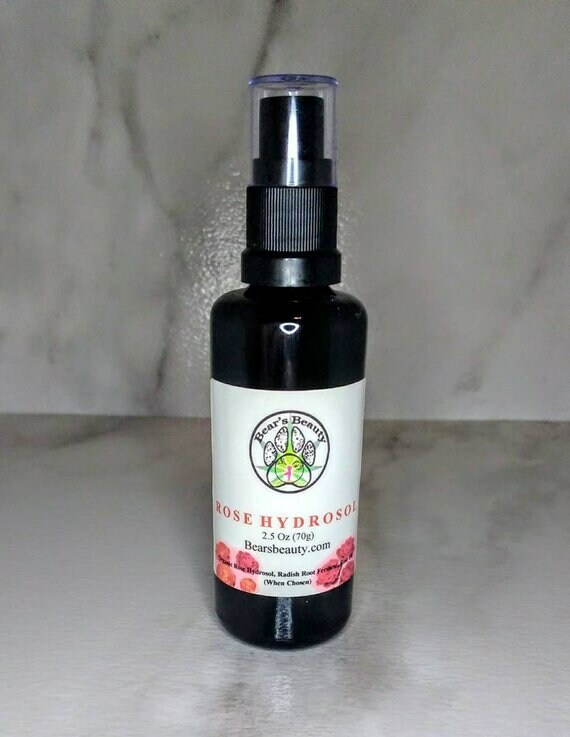 ★Organic Lavender Hydrosol helps balance skin and in combination with Tea Tree helps reduce excess facial hair over time as well as reduce breakouts. ★Organic Turmeric Hydrosol helps brighten tone + balance skin + reduce scars. Mist on face + body as desired. Mist onto cotton pat and swipe across skin after cleansing. In your cleansing routine, this would be used after cleansing and before any serum or cream. Mist 4-6 sprays into hands and mix with 3-4 drops of serum for a custom emulsion every day. ☛☛External Use Only. Keep away from kiddos and pets. Discontinue use and consult your doctor if irritation occurs. Avoid Eye + Mucous Membrane contact. Consult a Physician if you are pregnant + nursing. All statements above are for information purposes, Bear’s Beauty does not make any medical claims. Products not intended to diagnose, cure, treat, or prevent any disease or ailment. The information provided by Bear’s Beauty has not been evaluated by the FDA. All products are intended for Cosmetic Use Only. All text, copy, pictures, graphics,product names, and formulations copyright Bear’s Beauty 2012-2018 all rights reserved.